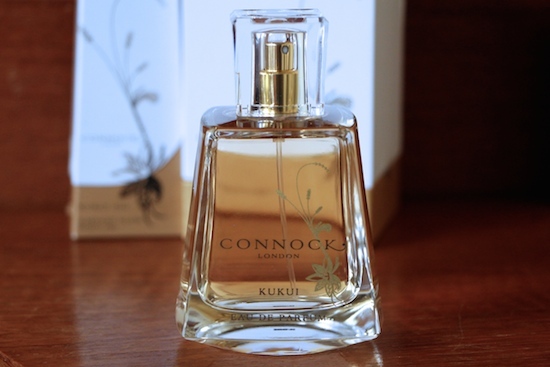 Here’s a warm, uplifting little fragrance to see you through to the summer; Connock London’s Kukui. If you haven’t had the pleasure of smelling the Kukui range then you’ve just found another thing to add to your list – it’s a beautifully soft and comforting scent that has a slightly woody, masculine base. My first introduction to the range was actually a few years ago now and it was the body wash, of all things. A body wash is very rarely going to be the true star of any luxury bath and body collection, but this one had me hooked from the first use. It also, unfortunately, had Mr AMR hooked and another male, too – a family member who was staying with us whilst he fitted the new bathroom. (God, how I miss that gorgeous bathroom. Roll on house renovations!) By the time I went in for my third or fourth use, the body wash was down to the last dregs! Me (shouting from the bathroom): where has all the body wash gone? Mr AMR: do you mean the shower gel? Me: yes. The really nice expensive one. Mr AMR: that one in the square bottle? Family Builder (ceasing his hammering): oh that smells well lovely that one does! Not much left of it though, you might want to get some more. You could actually repeat almost the exact conversation, with the same participants, for Laura Mercier’s Pistachio Cream Body Wash and Laura Mercier’s Almond Coconut Cream Body Wash. Both of which disappeared at the rate of knots and both of which, incidentally, also have square bottles. (If you’re a beauty brand looking to expand into the male market, you know which shape to make your packaging.) But it was really the Connock Kukui that took the biscuit, so to speak, in terms of popularity. It went down the plughole faster than a newt in lead trousers. Try again: it’s like lying wrapped in a cashmere blanket in the winter, in Britain, perhaps staring out of the window, watching the rain pelt down on the garden, and dreaming of the beach. There. That’ll do. It’s a perfect blend of the exotic and the familiar. If you are nipping past Harrods, do hop up to the top floor and give this a try – if you want to find it online then it’s at Connock London here. £75 but for 100ml, which isn’t too crazily priced at all. You can read more fragrance reviews here – go on, waste a few minutes!